“Through his research, teaching, and writing, [Samuelson] had more impact on the economic life of this country and the world than any government economic official…” —Larry Summers, nephew of Samuelson, and Director of the White House National Economic Council. In my judgment, it is difficult to sidestep the conclusion that as the teaching of introductory economics has followed in Samuelson’s footsteps, its advice has contributed to certain of the economic problems that the United States faces today. Samuelson has appeared to favor a substantial role for the state…[he] has been a strong supporter of the welfare state and [government] antipoverty programs. Free-market Economist Milton Friedman (who won the Nobel Prize in economics in 1976 and who first met Samuelson while both were students at the University of Chicago) disagreed with Samuelson’s solutions and emphasis on government interference in the marketplace. The two would often appear in public debates, and wrote opposing views for several years in columns in Newsweek magazine. 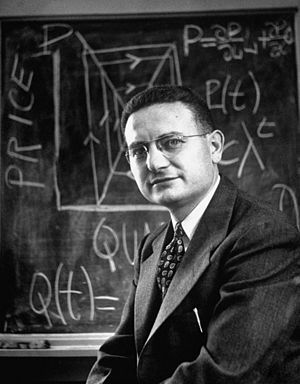 In addition, Friedman’s position was persuasively presented through his PBS television series, Free to Choose. Notwithstanding reports that all economists are now Keynesians, we do not believe that more government spending is a way to improve economic performance. This entry was posted	on Tuesday, December 15th, 2009 at 9:10 am	and is filed under Economics, History. You can follow any responses to this entry through the RSS 2.0 feed. You can leave a response, or trackback from your own site.